I was a smoker for nearly 12 years. That's insane to me. I never thought I would become addicted. I warn kids I see smoking that it will eventually control their lives. They don't believe me. Hunched over, hugging myself, when I smoked, I was a little a ball; a smoking nervous wreck. I used it as a means of escape: Escape from work. Escape from a party. Escape from family. When I smoked, I was in my own bubble where actions had no consequence and instant gratification was a treat I always deserved. It was "me time". I told myself I needed it and that it was good for my health because it calmed me down. I have low blood pressure and I joked that smoking brought it up to normal. Quitting took a full year of re-training my brain. I decided I wanted to quit. This is key. You have to want to quit. So many people told me to read "the book" but I didn't. Instead, I gave myself rules. I told myself: No smoking until after breakfast. This was an eye opener: I often smoked in lieu of eating and I felt better eating breakfast first. I felt better realizing that I could find the time to decide what to eat, to make it and then to eat it. Truthfully, many times after I established this rule, I would go downstairs and smoke immediately after. Once I got better at following this rule, I tried to adhere to it for all meals of the day. It was strange to force feed myself just to be allowed to smoke a cigarette after. Realizing my brain prioritized smoking over food was helpful to the cause. 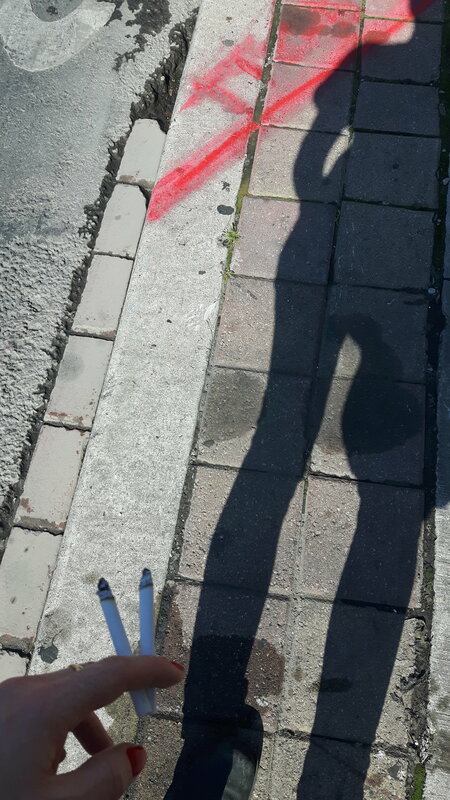 I stopped smoking while walking. I would tell myself that once I got to my destination I was allowed a cigarette. Man, did I hustle to get places after that rule was enforced. Mindlessly smoking was a tough one. Sometimes I would look down and be smoking but not able to remember lighting up or making the decision to smoke. Sometimes, I would start smoking then realize I had tossed my cigarette mindlessly somewhere not remembering when or where. If someone else was smoking, I would smoke. A rule I established was: Unless I was planning on smoking, I didn't smoke just because it was an option or offered. I broke this rule many times. The more focused on quitting and stopping, the more I recognized the idiosyncrasies of an addict. This helped me too. I began to cut down. I would tally my cigarettes day by day and week by week. I went down from 15 a day to 10 to 5 over four months. Then, I was stuck on 5 a day for a long time. One before work, one after work, one when I got home and inevitably there would be more that I needed. I did need them: I was still addicted. Finally, a little over 3 months ago, I got firm with myself. I told people I had quit so that I was forced to adhere lest I be found out. By this time, I could smell it on other people and knew that I had smelled bad for 12 years. It clung to the air in my house. I opened the windows. I washed everything. I hid the beautiful vintage ashtrays. I threw out all the lighters. Before bed, I would sneak outside and in the dark. I would smoke half a cigarette, overwhelmed with guilt and pleasure. Finally, a big change in my life happened and it was the turning point. I smoked half a cigarette a day for 2 weeks and that was that. I have been smoke free since an unknown date. I'm not counting. It's been a little over 3 months. Now, my "me time" is spent cooking and then eating. I am off-duty to the world. I don't answer my phone, I turn up my music, I listen to the food and I breathe.